The Unicode Consortium is inviting artists and designers to submit cover design proposals for Version 9.0 of The Unicode Standard. This is the first time Unicode is extending this invitation. 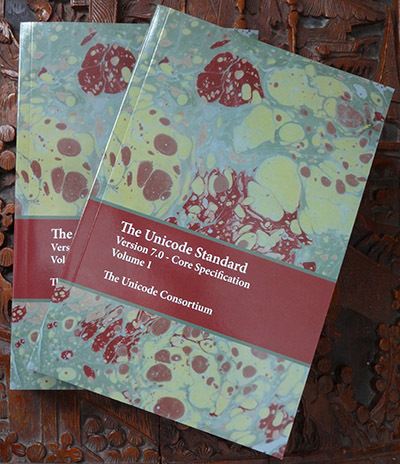 The cover design would appear on the Unicode Standard 9.0 web page, in the print-on-demand publication, and in associated promotional literature on the Unicode website. The chosen artist will receive full credit in the colophon of the publication, and wherever else the design appears, and receive $700. The two runner-up artists will receive $150 apiece. Everyone in the world uses Unicode every time they read or type any character on any laptop, tablet, or smart phone. This is the opportunity to be on the cover of the standard for those characters.